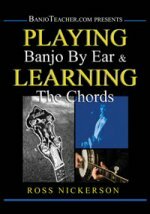 130 minute DVD instruction to help you play without tablature, learn to memorize, learn the chords better, learn to jam on banjo and loads of practical tips for the student wanting to play with others and trying to reach the next level. Includes instruction on learning the chords to songs, playing rolls and chords, up the neck chords, minor major and seventh chords. Tips and exercises to improve your chord changing ability and practice backup. How to improve timing, pick steady, improvise simply, add slides, hammer-ons, and pull-offs to chords and chord changes in the song. Download now from PlayBetterBluegrass.com!